Recently, several of my clients have become extremely interested in exploring what they call their "corporate DNA." At first I resisted, because I was concerned that this metaphor implied that they were incapable of changing. But for the most part, this model is being used to explore the unique identity of an organization -- the strengths that are admired, and should be preserved and transmitted to future generations. Most every kid who has the luxury of getting an education learns the basics of DNA. DNA is what causes a giraffe to have a long neck, kangaroos to have pouches, and porcupines to have quills instead of fur. Tadpoles turn into frogs, not butterflies, because of their DNA. And a lot of behavior has its roots in an organism's DNA. Birds have wings, but dogs don't, therefore dogs don't fly. Snakes, lacking both legs and wings, resort to crawling. But what is the meaning of the DNA of an organization? If you look up "corporate DNA" on Wikipedia you'll be redirected to an article on "organizational culture." But I don't think they're the same. Here's how I distinguish them. Organizational culture is "the way we are" today, including the laundry list of do's and don'ts that the old-timers share with newbies on their first day of work. It's "the way we do things around here," even if we've forgotten why we're doing them. Organizational culture is the collection of observable patterns in a company at the present time. People naturally assume that these patterns will continue into the future. And they probably will, unless the organization experiences a deep, sometimes radical, change. Organizational culture is made visible through behaviors, and behavior is driven by assumptions, beliefs, and patterned thinking, in addition to the conscious choices that we make to perpetuate that culture. In contrast, corporate DNA is the historical reason why we behave this way, the genetic code at the root of these behaviors. Like the DNA of birds and snakes, it influences whether our organization will fly or crawl. Although we can change our behaviors radically, our DNA establishes some boundaries. A dog that's been abused might bark aggressively or bite humans, but it won't start eating worms, tweeting, or building a nest out of twigs. 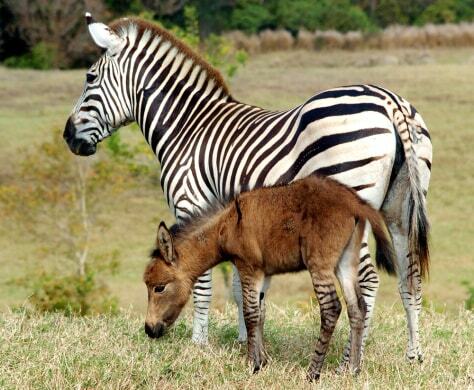 "A "zonkey" -- a zebra-donkey hybrid. Photo credit: Chris Brandis / AP (2005). As a scientist, I worry that DNA as a metaphor for corporate identity isn't technically accurate. People frequently talk about their company's DNA as if it can't, or shouldn't, be changed. Some executives proudly speak of their corporate history as if their future is determined primarily by their past. So before we use this metaphor, there are a few things we should know about DNA. DNA in nature isn't forever fixed, nor does it unalterably determine what happens in the life of an organism. Mutations occur naturally, scientists intentionally create genetic modifications, and reproductive processes combine genes in ways that create new and sometimes surprising results, like the baby "Zonkey" in this picture. (See more fascinating hybrids here.) Similarly, organizations that grow through mergers and acquisitions must integrate the combined DNA of their previously distinct companies. Most genetic code isn't expressed. For example, over 98% of human genetic material is so-called "non-coding DNA." This DNA isn't junk! It's important to regulating and protecting the genome, but it doesn't directly create the stuff that makes us human beings. A parallel in organizations is the need to focus on examples that bring us together around our shared purpose, and selectively forget what doesn't contribute to a better future. Environmental factors like temperature and light can impact gene expression. For example, Thomas Hunt Morgan's Experimental Zoology reports that genetically identical caterpillars exposed to different colors of light during their chrysalis stage developed dramatic differences in wing color. Likewise, organizations are subject to external influences, and some (but not most) do find ways to break free of their historical roots rather than continue unproductive trends, or become extinct. But in spite of my scientific misgivings, I've found that exploring the DNA of an organization can be an extremely effective way to create a shared sense of identity among even globally diverse and dispersed teams. Teams with a clear understanding of their shared core identity, and the kinds of behaviors that naturally spring from this understanding, are more cohesive. Individual behaviors tend to naturally align with this team identity, without the need for direction, rules, and oversight. If you want to discover your organization's DNA and use it to unite your team, for cryin' out loud don't rush over to your PR department to pick up a stack of those glossy brochures containing the company history and poignant stories of the founders. I know managers who have hundreds of these tree-killers stashed in their office. Giving them out provokes cynicism, and pretty much guarantees they'll go straight into the recycling bin. Here are three powerful and engaging exercises that I've found to be much more effective than handing out brochures. It's still all about stories. (People remember stories, as Chip and Dan Heath explained in Made to Stick.) If you want a message to change the results you're getting in your team it must be Heard, Understood, Remembered, and Acted upon (HURrAh! ), so I strongly recommend using stories as the basis of your DNA discussions. But those stories must be shared and discussed, not just read. A story-based "DNA expedition" will generate increased loyalty to your company, and inspire behavior that aligns with shared values discovered during your DNA session. Suntory -- In 1899 Shinjiro Torii opened a wine shop in Osaka, Japan, and then proceeded to make a popular port wine domestically. Later Suntory was the first to distill whiskey in Japan. Of course, many people believed that a great whiskey could not be made in Japan, but his "Yatte Minahare!" spirit (roughly translated, "Go For It!") prevailed. Kuraray -- Magosaburo Ohara founded the company in 1926, and his son Soichiro Ohara has continued the legacy of "contributing to the world and individual well-being through actions that others are unable to produce." This would be just a slogan on a website if it weren't for my personal experience working with Kuraray for the past seven years. I find myself quoting Mr. Ohara's advice to teams locked in an unproductive pattern of "death by consensus": "If we wait until everyone agrees, it's too late! We must take action when only two or three executives agree." Yamaha -- In 1887 Torakusu Yamaha built his first reed organ and carried it on his back over the mountains to the music university in Tokyo, where it was flatly rejected due to its poor tuning. Undaunted, he created an improved version that was the foundation of the Yamaha music business. Hewlett-Packard -- The friendship forged by Bill Hewlett and Dave Packard in 1934 was the basis of a legendary company. I was fortunate enough to work there for 10 years, while Bill and Dave were still a palpable presence in the form of The HP Way. As an idealistic young person who believed the stories in those glossy brochures, I felt it was my personal responsibility to live up to the legacy that these two gentlemen had created. This resulted in an annual chastisement in my performance reviews: "Kimberly has unrealistically high expectations for herself and others." Yup! Ya got that right! In addition to studying the adventures of the founders, review significant stories that punctuate the company's history. Tales of expansion, new product launches, and other successes are valuable, but so are stories of perseverance during difficult times, as well as how people behaved when facing overwhelming challenges and setbacks. EXERCISE #1 -- "Exploring Your History"
Prepare in advance by having each team member read relevant stories from the past and/or think of stories from their own experience that demonstrate the corporate DNA at it's very best. Sitting in a circle, have each person share the story that had the most positive impact on them, and explain why it impacted them. Writing BIG on sticky notes, have everyone in the group write a keyword or two that capture the "essence" of the company identity contained in the stories. Place the sticky notes on flipcharts in the center of the circle as shown in the picture below. Piecing these collages together creates a patchwork quilt that vividly conveys the company's DNA. Don't you dare just throw them away when the exercise is over! Find a way to preserve and share them. Gather in small teams around white boards, and together draw a picture of some of these stories -- ideally without talking. Then have each team present their drawing, and have the entire group distill "the essence" of each story. Based on how the team drew the pictures and told their interpretation of the story, what qualities and characteristics are demonstrated? Discuss what will survive into the future? What will still be "core" 50 years from now? Determine which of these qualities and characteristics should be passed on to future generations and preserved for the long-term future of your company. Brainstorm how these principles serve as guiding principles in your business today. What stories from your own experience align with these principles? What other situations are you facing that could benefit from the principles and behaviors modeled in these stories? How can we demonstrate the very best of our corporate past through our own behaviors in the present? Sharing and discussing these stories as a team can produce powerful insights about what is admired and valued in your team, and influences people to act similarly. In general, people seem to find it easier to think from a negative perspective, and the next exercise I suggest directly appeals to that tendency. This is a fabulously fun exercise, and one that even engineers enjoy. Ideally you'd do it right after the first exercise. EXERCISE #2 -- "This Will Never Happen"
Break into teams of 3 or 4 people maximum. Products that we will NEVER make. News headlines you will NEVER see about your company. Advertising slogans that we will NEVER use. Famous people we will NEVER feature in commercials. Behavior and language you will NEVER experience at work. You can also add other categories for this brainstorm that are relevant to your business. One of my clients, famous for outdoor sports equipment, had a terrific time with this one. Rest assured, they are never going to make "senior diapers," their slogan won't ever be "You're in good hands," and Lady Gaga will never get an offer to promote their extreme sports products. You can take this exercise one step further by reversing each of these "NEVERS" to discover who you are and what you stand for. Dreamers and scenario planners have been using this technique for years: Jump into the future and vividly imagine a possibility, and then explore what that scenario implies about the required behavior and choices that need to be made today to bring that future into existence. This exercise will set the stage for you and your team to be "DNA Ambassadors," spreading the best of your identity to everyone who comes in contact with you. EXERCISE #3 -- "Your DNA Evolution"
Imagine it's 50 years from now, and you have long since retired. What stories do you hope people working in your company will tell about you and your team? Self-organize into small groups, and create these stories from the future. For example, you might imagine that your company is celebrating the 50-year anniversary of the launch of your amazing product or service. Or perhaps 100 newly hired employees are crammed into a room to watch and discuss a video about how your team tackled and overcame seemingly impossible challenges. What do you hope they will be saying about you? Present your stories in the form of a news report from the future, complete with roving reporters, satellite links to remote locations, and interviews of some of your now-retired team members. Don't skimp on the drama! Set up a news desk, get some pretend microphones (a rubber chicken works great for this), and ham it up! Just reading about this exercise doesn't even come close to the experience of living it. Don't underestimate the creativity of your team! I've done this exercise with all kinds of people in all kinds of jobs, from executives to engineers, and everyone -- including the stodgiest curmudgeons -- totally loves it. For better or worse, today's workplace behaviors will become tomorrow's corporate history. As a leader, you are a DNA Ambassador. Don't just slap a corporate propaganda poster on the wall. Hanging a big sign over the doghouse door that reads "You are a cat" won't suddenly make your golden retriever meow, hunt mice, or go crazy for catnip. And don't let yourself be trapped by the past! You might have been born with straight black hair, but you can dye it platinum blond and get a perm if you like. Finally, take advantage of the power of selective forgetting. At a recent Wiefling Family Vacation, my brother read a heart-warming poem about what it meant to be a Wiefling. Honestly, I didn't remember our childhood being all that much fun. But he was extremely skillful in choosing which stories to tell and which to leave out. As rough and tumble as our family is, everyone had tears in their eyes by the time he finished. (And I definitely prefer his version over what I remember!) Our corporate DNA is a doorway, not a prison. The stories we tell influence our beliefs, our thinking, and ultimately our behaviors. Don't go the way of companies like Enron! Create a story that you and your team will be proud to hear told 50 years from now. Right on, Kimberly! DNA/ the corporate culture resides in the network of conversations that are said and unsaid. Love YOUR stories and analogies. Thank you for reading and sharing your feedback! Your encouragement mean a lot to me. Loved your piece! Thanks for sharing. You're right that organizational DNA is not immutable. But it can be damn hard to change, as both of us have observed together. My own, best experience with success here took about three years and involved deconstructing a particular organizational value and then rebuilding it from scratch. Very hard work. I recall hearing Geoffrey Moore (Crossing The Chasm, The Gorilla Game, etc.) speak on organizational DNA, claiming that it is quite mallable during the first year or so, but from then on becomes very firmly fixed.